One of the most frustrating discussions of 2012 was about voter identification laws. Voter ID laws seemed like they would disproportionately impact non-white, student, and elderly voters, who were widely assumed to tilt Democratic. There were big, flashy numbers about the number of registered voters without photo identification. Pennsylvania, for instance, famously announced that 759,000 registered voters didn’t have photo identification, causing a hyperventilating Dave Weigel to depict the law as “an apocalypse waiting to happen.” But voter ID laws had been implemented across the country over the last decade, and there just wasn’t solid evidence that voter ID laws meaningfully reduced turnout, let alone hurt the performance of Democratic candidates. Even the best studies were very weak, and there were states like Georgia and Indiana, where Obama excelled after voter ID laws were enacted. The consequences of voter ID laws were imperceptible. But finally, there are better numbers on how voter ID laws might influence one critical battleground state. North Carolina is considering a strict new voter ID law, so North Carolina’s Secretary of State has conducted an analysis estimating how many voters have a state-issued photo ID. This isn’t necessarily new; states have done these sorts of analyses before. But North Carolina’s analysis overcomes many of the limitations that reduced the usefulness of previous assessments, like Pennsylvania’s. Other efforts required an exact match between voter registration and DMV databases; North Carolina expanded their matching criteria to allow for slight variations in names and data entry errors. North Carolina didn’t just look at how many registered voters didn’t have voter ID, they also looked at how many voters from the 2012 general election didn’t have voter ID. That’s very important, since it’s easy to imagine that voters without a car, or the elderly and the young would be especially likely to stay home on Election Day. And since North Carolina tracks voter registration by race and party, we have a pretty clear idea of how they would have voted. The North Carolina data confirms what many suspected: Voter ID laws have a disparate impact on non-white and Democratic voters. According to the North Carolina Secretary of State, 46 percent of unmatched voters in the 2012 general election were non-white, compared to 30 percent of all registered voters. Similarly, 36 percent were black, compared to 23 percent of registered voters. And 58 percent of voters without a state-issued ID were Democrats, compared to 43 percent of all registered voters. But despite a disproportionate impact on Democratic-leaning groups, the electoral consequences of voter ID seem relatively marginal. After expanding their matching criteria, the number of North Carolina registered voters without a state-issued photo ID dropped from 612,955 to 318,643. And of those unmatched registered voters, just 138,425 participated in the 2012 general election. That confirms that voters without photo identification are far less likely to vote than their peers: 72 percent of registered voters with a state issued photo ID participated in the 2012 general election, compared to just 42 percent of voters who couldn’t be matched with a license or other form of identification. Of those unmatched registered voters who didn’t participate in 2012, fully 63 percent hadn’t participated in any of the last five general elections. By plugging in the exit poll numbers for race and party identification—which isn’t quite the same as party registration—we can estimate that Obama would have won approximately 60 percent of unmatched voters, by a margin of about 25,000 to 30,000 votes. As a result, Obama’s share of the vote in North Carolina might have dropped from 48.3 to 48 percent, expanding Romney’s margin of victory from 92,000 to about 120,000 votes. 25,000 to 30,000 votes could flip a very close election, but nothing more. In 2012, no state was so close. A few caveats. The Secretary of State analysis attempted to match voter registration with state-issued photo identification, but a number of alternative forms of identification—ranging from passports to student IDs—may be acceptable, depending on the law. Some unknown number of voters would probably acquire a valid form of identification to allow them to vote. Additionally, the results in North Carolina may not be representative of other states. For instance, North Carolina has large black and student populations that might make the state something of a “worst case” scenario for Democrats. On the other hand, North Carolina isn’t full of huge cities like Philadelphia or New York, where urban, Democratic voters are unusually dependent on public transportation and less likely to own a car. 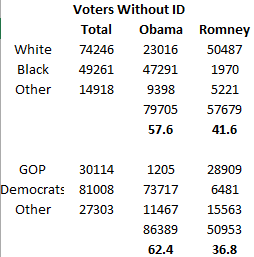 These data leave no question about whether voter ID laws have a disparate impact on non-white voters. In that sense, Democratic fears and Republican hopes are confirmed. But the North Carolina data also suggests that voter ID laws are unlikely to flip the outcome of a national election, even if it does have an objectionable, disparate impact on non-white and Democratic-leaning voters. That doesn’t mean it couldn't play a role in a close election—and close elections do happen. But Republicans expecting to flip Pennsylvania or Democrats fearing that Republicans will steal elections with voter ID should be circumspect about the comparatively modest electoral consequences. Many of the registered voters without a photo ID just aren't voting and 40 percent of them are probably voting Republican. If you want voter ID because you think you'll steal Pennsylvania, or you're opposed because you're concerned it's a Democratic apocalypse, move on. It's not the apocalypse, even if it is an affront to voting rights.